← IHBC’s latest ‘Jobs etc.’ skills review: Specialist areas and skills in demand, from design and project management to regulation and more. 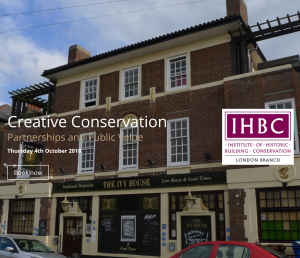 IHBC London Branch Conference launched and booking open: ‘Creative Conservation: Partnerships and Public Value’, 4 Oct – Places limited and values high! The IHBC’s London Branch has launched another salvo in its renowned series of IHBC CPD-led conservation conferences, as it explores ‘Creative Conservation: Partnerships and Public Value’ at the Royal College of Physicians, on Thursday 4 October, with leading speakers and unequalled debate. ‘And such thinking usually leads to cheaper and more cost effective outcomes too, as well as being richer in culture and meaning’. How are we adapting and changing to meet these challenges, and what creative means are there to keep our profession at the forefront of protection of the historic environment? In this, the fourteenth of IHBC’s London Conferences, we will be looking at how national organisations such as Historic England and the National Trust are modernising their agendas; how funding bodies are responding to needs in the third sector and how we can do more to promote the sector.